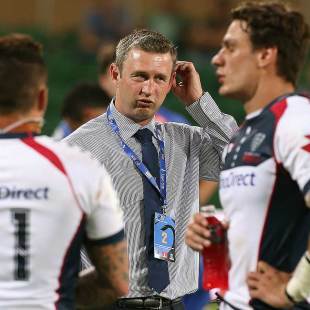 Outgoing coach Damien Hill is proud of his record while in charge of the Melbourne Rebels and is hopeful his legacy at the club can live on for many years. The Rebels finished their season on a high with a remarkable come-from-behind 38-37 victory over the Highlanders at AAMI Park on Friday night, a result that looked near impossible when they trailed by 20 points with 20 minutes remaining. But Hill's side stuck to their game-plan to score four late tries, with the winner coming at the death through Bryce Hegarty. The remarkable triumph was the fifth for the Rebels in 2013, a mark that beats the three (2011) and four (2012) victories Hill led the side to in his previous years in charge. Despite not being able to take the Rebels to the finals during his reign, Hill was proud of the results he was able to achieve. "Year on year we have improved," he said. "Not to the extent that people probably would have liked, but you have got to give credit to the quality of this competition. It is the toughest provincial competition in the world. We have gone from three wins to four wins to five wins and we have improved our placing on the ladder in a city that is not known for its rugby. There is a lot to be proud of for the playing group, myself, the coaches and the group overall." Hill will be replaced by Tony McGahan in 2014, so may not get to see the full fruits of his labour as the young Rebels squad continue to develop and their results get better. "The feeling at the moment is that the job is only half done and there is a lot I think I can still contribute," Hill said. "However it is not to be, so I have got to cop that and really encourage the supporters to get behind the new players in my role and push us on to bigger and better things." Fly-half James O'Connor is one player who won't be at the Rebels next season, while the future of fellow Wallaby Kurtley Beale is still up in the air. But regardless of who remains in Melbourne in 2014 and beyond, Hill believes the future is bright at the club. "It is a very capable playing group, there is a lot of enthusiasm in this group and they showed us how close they are," he said. "I would like to think that one of the legacies that is left by the departing players and coaches is what a team can achieve. The closeness of the playing group and the football department really does have an impact on the field."